London’s newest theatres is a recreation of one of its oldest. On January 9 of this year the Sam Wanamaker Playhouse opened with a production of John Webster’s tragedy, The Duchess of Malfi. 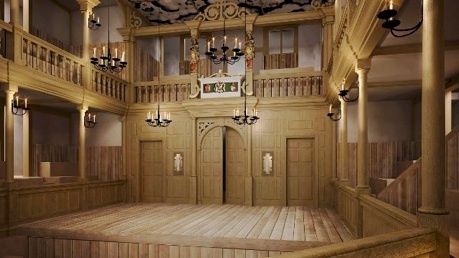 The Wanamaker is a recreation of an indoor playhouse of the time, like that of Blackfriars, where Webster’s play would have premiered in 1614. 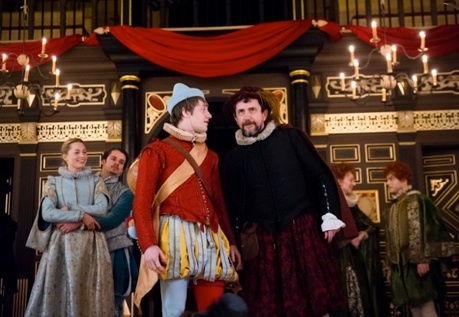 The Wanamaker is adjacent to and run by Shakespeare’s Globe Theatre next door, so that now playgoers will have the chance to experience both the day-lit theatre of outdoor venues like the Globe and the candlelit theatre of indoor venues like Blackfriars. The Globe will now have a winter venue when local weather makes an open-air theatre impractical. The new Wanamaker auditorium is like a wooden jewel-box. It seats only 340 with a playing area that is nearly as big as the main seating area. The seats are on padded benches without backs steeply raked and only three deep on the first of the three galleries. In “The Pit” the seats are also raked and are crammed into two halves of a semicircle. The stage is has three doors as entrances and above the doors is a balcony for musicians. The galleries continue onto the playing area, eight persons deep on either side. The playhouse is lit with six chandeliers holding twelve candles each that can be raised or lowered to suggest outdoor or indoor scenes. In addition, there are “windows” at the back of the theatre to let in (artificial) sunlight. Since plays were staged in indoor playhouses from 2-5pm, shutters for these windows would be closed or opened depending on the setting of a scene. During The Malcontent, shutters were opened on the eastern side of the auditorium for a scene set at dawn. Some people will be drawn to the Wanamaker just to experience candlelit theatre from the late Elizabethan and Jacobean periods. Others will come to see plays and operas from the period that too many classical theatre companies neglect. One such play is The Knight of the Burning Pestle (1607) by Francis Beaumont (1584-1616). Critics who think that metatheatre developed in the modern period, simply don’t known their theatrical history. Beaumont’s play is one that depends primarily for its laughs on heightening our consciousness that what we are watching is a play. Canada’s Stratford Festival staged the play in 1990 and it was such a success that it was revived the following year, but has not been seen there since. Indoor theatres were not for ordinary folk. While entrance to the Globe could be had for as little as a penny, the minimum entrance at an indoor theatre was four pence, rising to seventeen pence for those who wished to be seated on the stage. 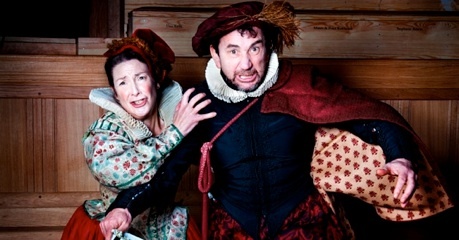 In Pestle, a Citizen (Phil Daniels) and his Wife (Pauline McLynn) and their apprentice Rafe (Matthew Needham), have come to see a play at an indoor theatre. The Citizen’s Wife and Rafe have never seen a play before in their lives. Through their reactions Beaumont satirizes the rising middle class that was beginning to be able to afford luxuries, like indoor plays, that had previously only been available to the wealthy. The play the Citizen and company have come to see is The London Merchant. The merchant of the title is Venturewell (John Dougall), who dismisses his apprentice Jasper (Alex Waldman) in order to nip the budding romance between Jasper and his daughter Luce (Sarah MacRae) in the bud. Venturewell, however, has acted too late, for love has already blossomed and Jasper vows to carry Luce away to be married. Jasper has to act quickly because Venturewell has already promised Luce to the dandy Humphrey (Dickon Tyrrell). In a subplot, Mistress Merrythought (Hannah McPake) has grown tired of the absolute impracticality of her husband Merrythought, who feasts and sings with no care that he is running though all of his money. Mistress Merrythought will share none of her private wealth with her elder son Jasper, and promises it all to her younger son Michael (Giles Cooper). One level of the comedy is that the Citizen and his Wife take offense at the action. They take the side of Venturewell and Mistress Merrythought against Jasper since they disapprove of Jasper’s disobedience and Merrythought’s profligacy. Quickly growing bored with the plot, the Citizen thinks he has the right to demand to see what will please him, and what will please him and his Wife most is to see Rafe on stage. They don’t want a play in the world around them but an escapist fantasy where Rafe will be the hero. They want to see Rafe perform daring deeds. So the cast hastily devises a story inspired by Don Quixote where Rafe, after reading romance novels like Amadis de Gaul, decides to undertake heroic deeds for the honour of grocers and takes the pestle as his emblem. Neither Rafe nor the Citizen and his Wife get the pun of “pestle” and “pizzle”, but a director Adele Thomas makes it clear enough with a phallic pestle the dwarf carries about with him. He is assigned a squire Tim (Dennis Herdman) and a “dwarf” George (Dean Nolan), of course the largest man in the company. Rafe’s adventures and the story of The London Merchant at first play out side by side but eventually Rafe’s actions affect those of the other story, as when the arrival of Rafe and his men frighten Mistress Merrythought into dropping her box of treasure which later Jasper finds. But if the wishes of the Citizen and his Wife overturn invade the play they were meant to see, so they, like everyone else, are caught up in the celebration of non-materialist happiness as represented by Merrythought. Director Adele Thomas sets the note of comedy right from our entry into the auditorium as we watch Herdman and Nolan attempt to light the chandeliers that are rising and falling exactly when they should not. The Citizen and his Wife arrive late and have seats in the front row of the Pit. Thomas adds to humour by giving the Wife a large paper bag of sweets that she rustles noisily all through the first scene as she offers samples to all those around her. Not only do we get the comedy of a newcomer to the theatre but the humour of the actors attempting to control their anger over the racket she makes. In this way there are more amusing things happening at any one time to take in. Beaumont’s play itself is funny, the accommodation of the Citizens’ play is even funnier and the reactions, positive and negative, of the actors to the near-chaos of the proceedings is funnier still. The play is an ensemble piece with no weak link. Pauline McLynn stands out for never making the Citizen’s Wife too much, but rather an ordinary person caught up in an exciting new experience. Matthew Needham deserves praise for delivering all of Rafe’s speeches perfectly straight, just as an earnest young man would do who was trying to do a job well. Dickon Tyrrell is hilarious as Humphrey. It is not only the elaborate pink satin outfit he wears and the silly pageboy wig, but the punctilious way he emphasizes the terrible rhymes in the rhymed couples Beaumont has given him. Alex Waldman is excellent at playing Jasper as the hero he is supposed to be inThe London Merchant. And Samuel Hargreaves, who dances during the interludes between each act besides currying the favour of the Citizen’s Wife who is so attracted to him, makes the character of the Boy much more on stage than you would expect from the text. To see a play that celebrates the theatre is a wonderful way to celebrate the opening of a new venue. With numerous entrances from the audience and exits into it, Adele Thomas makes us almost as much a part of the play as the Citizens and Rafe. In the end we all clap in time to the song, aware for the moment of the value of joy in life. Photos: (from top) Matthew Needham as Rafe, ©2014 Alastair Muir; interior of the Sam Wanamaker Theatre ©2014 Shakespeare’s Globe; Pauline McLynn and Phil Daniels as the Citizens; Samuel Hargreaves as the Boy and Paul Daniels as the Citizen (foreground) with Sarah MacRae, Alex Waldman, Hannah McPake and Giles Cooper. ©2014 Tristram Kenton.